Last time we went back to Holland, we drove over to Wuppertal, Germany with Hubby’s parents to visit some old family friends of theirs. Mr. and Mrs. L are about 86 years old, friends of my mother-in-law’s mom. Hubby had told me a little bit about Mr. L. Supposedly, during WWII, Mr. L was captured in Russia while serving in the German army. He was sent to a prison camp but somehow managed to escape. In the dead of winter, he walked from Russia all the way back to Germany. “You mean Mr. L was a Nazi?!?! ?” I asked Hubby. He couldn’t provide me with the answer to that or with more details on this intriguing tale. Of course, there could be many reasons why Mr. L ended up in the German army during Hitler’s reign, conscription (compulsory enrollment) probably being the cause. Defying his age, Mr. L turned out to be a very strong and robust man. Mrs. L was more fragile. When I hugged her, I was careful to not put too much pressure on her tiny bones. 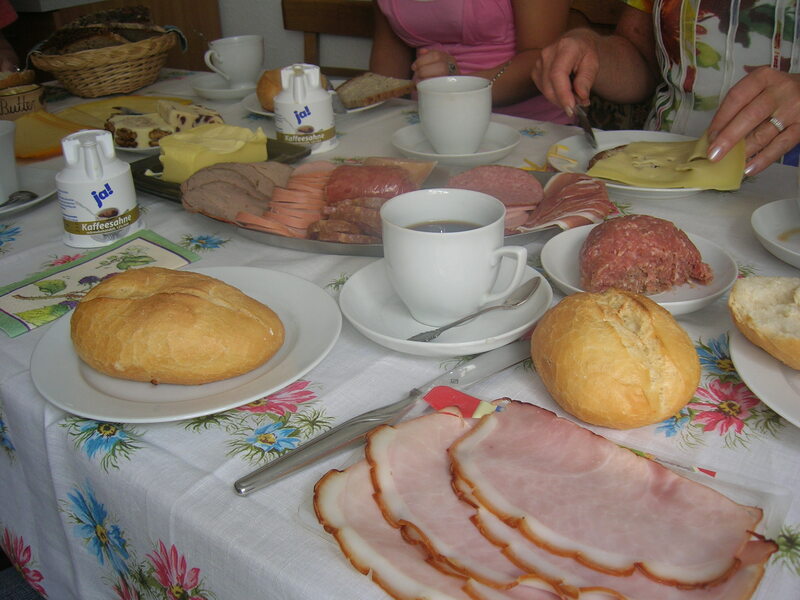 Mr. and Mrs. L had generously laid out a typical German spread for our lunch. 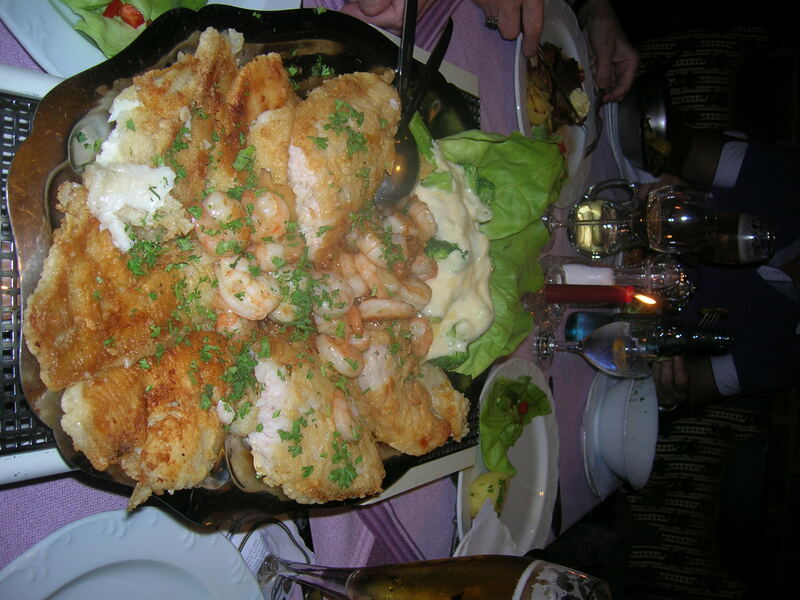 First we had Germusesuppe, a German soup consisting of various vegetables and noodles cooked in chicken broth. Then we moved on to spreading our breads with various cold cuts and cheeses. The bread, of which there were several kinds and included yummy rye bread, was no doubt purchased that morning from their local baker. My favourite things were the cheese spreads. Maribo walnut is a soft-ripened cheese with small pieces of walnut in it. There was another type of cheese that had cherries in it. I absolutely love soft cheeses so soft cheese + fruit or nut in it = a happy me. I did pass on the chunk of raw meat. I eat steak tartare quite a bit when in Europe but this one didn’t seem to have much seasoning. After lunch, Mr. and Mrs. L ushered us into their living room for wine and sweets. 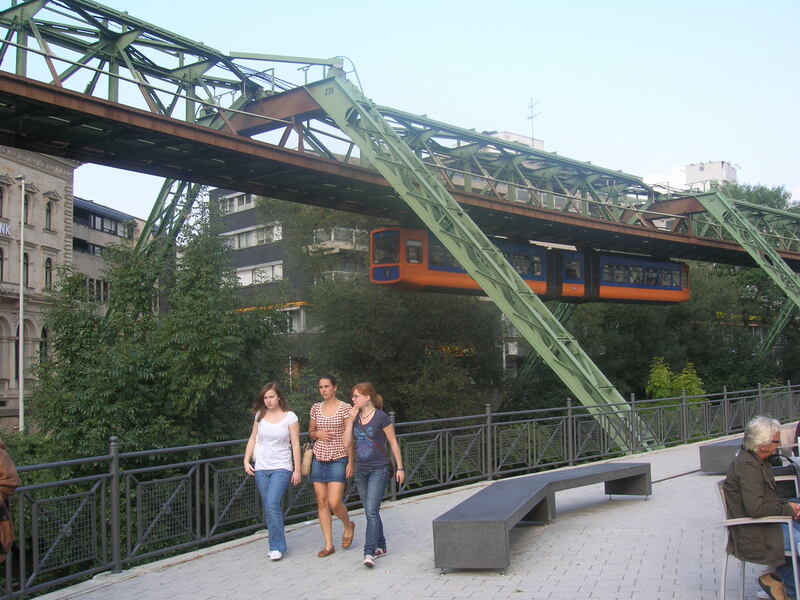 Wuppertal is widely known internationally for two things: one, being the home of Bayer where Aspirin was invented and two, the Wuppertal Schwebebahn. 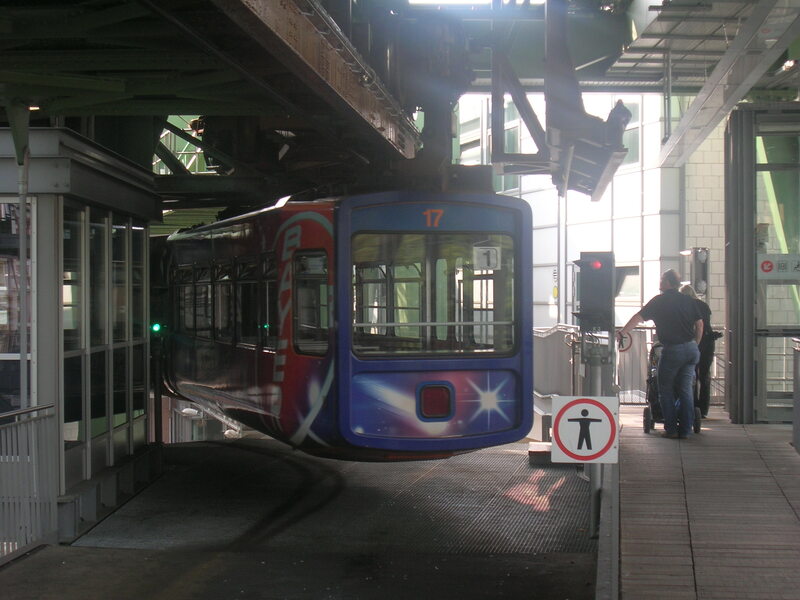 The Wuppertal Schwebebahn is a suspended monorail that opened in 1901. Mr. and Mrs. L live uphill from the central train station so we walked right on over. 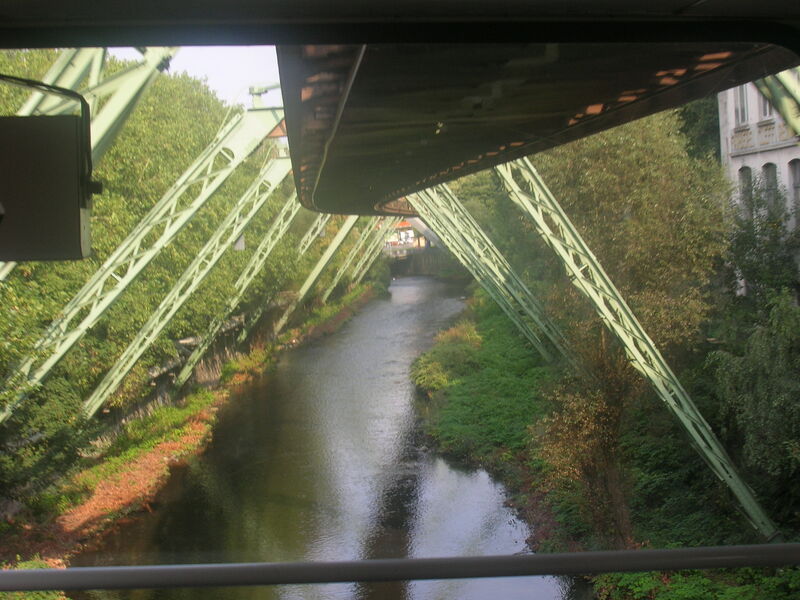 As we rode the Schwebebahn through town, Mr. L told us the story of Tuffi the elephant. In 1950, a circus decided to put Tuffi in the Schwebebahn as part of a publicity stunt. Tuffi, none too pleased about this, panicked shortly into the ride, crashed through the left side of the car, and fell into the river Wupper below. Tuffi received minor injuries. Nothing remotely exciting like that happened during our ride, which was filled with families on their way to or from the Wuppertal Zoo. 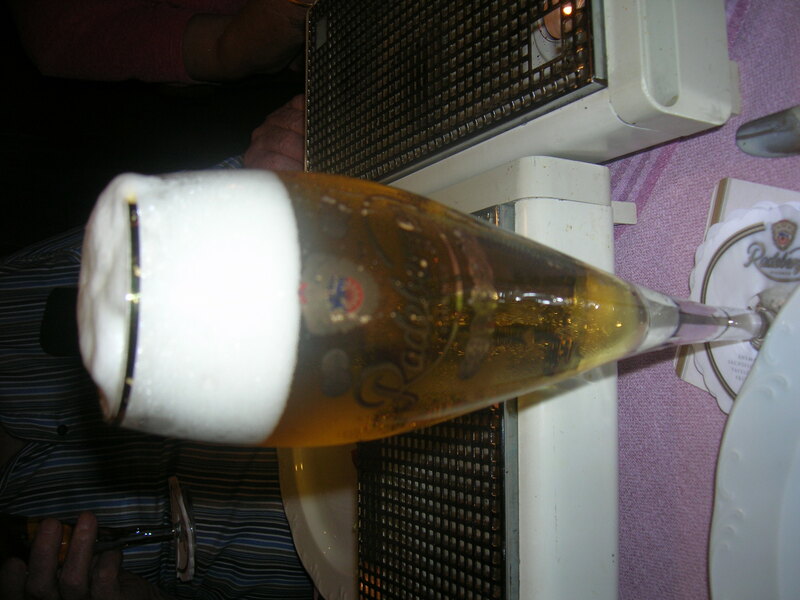 We stopped at Cafe-Island Wuppertal for tea and coffee. Cafe-Island Wuppertal is a hip cafe and cocktail lounge with large patio seating right next to the river. After our little coffee break we rode the Schwebebahn back to the central station to explore Wuppertal’s pedestrian shopping center. There was nothing really special here, just a typical modern shopping center. 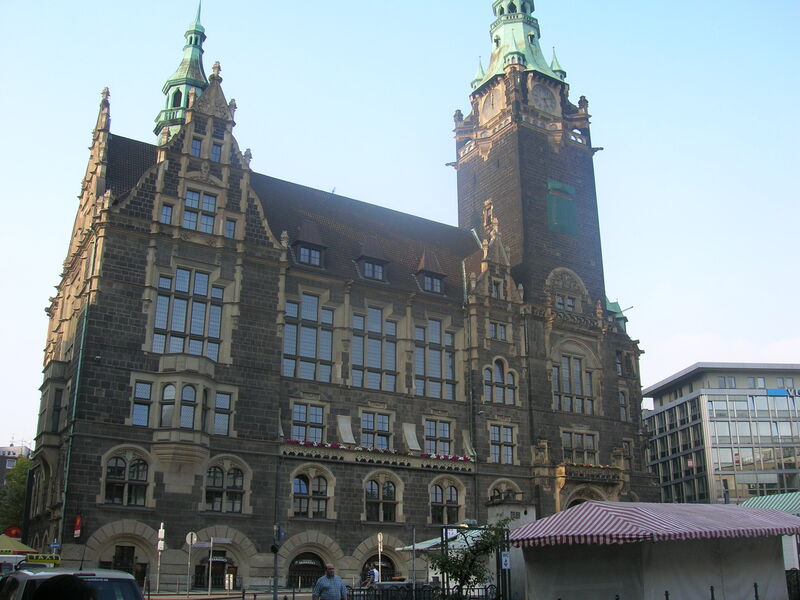 The Rathaus Galerie though is a grand looking building with a nice fountain next to it. We did find it amusing to take a photo with this German lady statute. 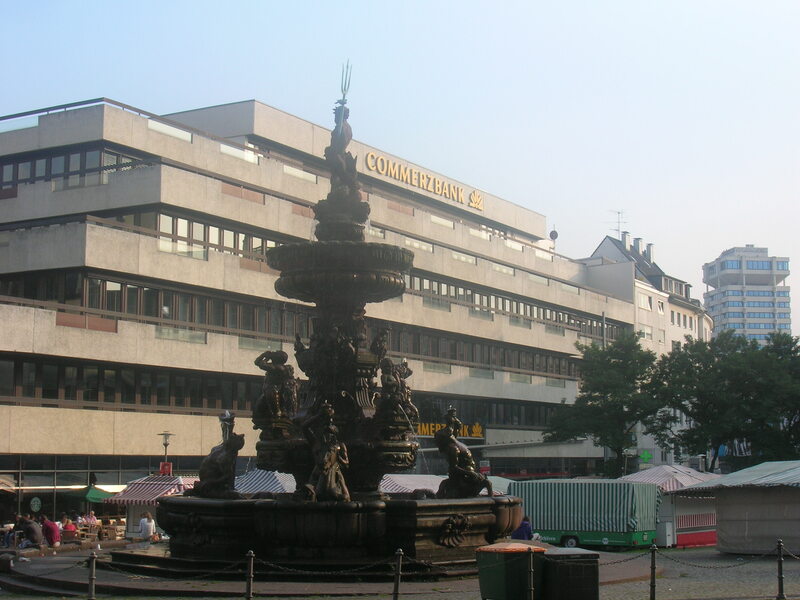 About 40% of Wuppertal was destroyed by Allied forces during WWII so the center looks mostly like any other modern city. Mr. and Mrs. L had heard that I wanted to eat real German food for dinner. I have repeatedly told Hubby and the in-laws that I do NOT want to eat Oriental food when I’m over there. For some reason, my father-in-law, a very nice man, thinks that I only want to eat Chinese food. I think it’s really that HE wants to eat Chinese food, which he doesn’t have the chance to eat much at home, so whenever I’m around he sees it as his chance. Dinner was at Restaurant Pinocchio, a typical meat and fish restaurant with, you guessed it, wooden Pinocchios hanging around. The sole waiter in the restaurant was a burly middle-aged man with a big stomach. The food was very heavy and very good. The table thought it was the funniest thing to hear me say “Ich bin zat,” meaning “I am full,” so there is video of me repeating that over and over. Mr. L had booked us a night at Domotel City Central, right in the middle of the shopping area. 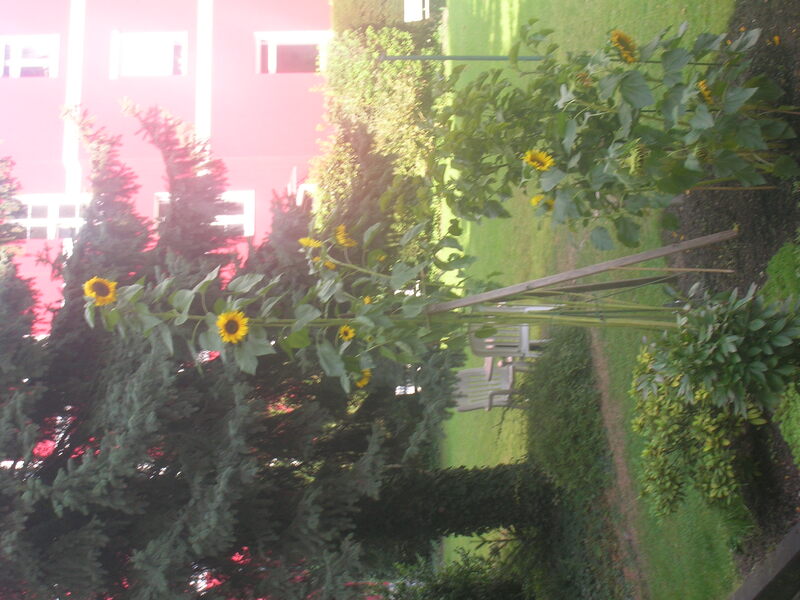 Like all the other German hotels I’ve stayed at, it was impeccably clean and had everything needed for a good night’s rest, complete with a generous breakfast buffet the next morning. We stopped by Mr. and Mrs. L’s residence the next morning before moving on to Cologne. There was more wine and sweets. As we said our goodbyes, Mr. and Mrs. L gave us some Stollen, a German fruitcake traditionally eaten during Christmas. Hubby had asked them the day before for their recommendation on what to bring back for his coworkers and they had thoughtfully remembered his question. I slowly ate my way through the Stollen back in the office at home, remembering our little trip to Wuppertal. Mr. and Mrs. L sent us a nice card and gift when Hubby and I got married. I hope they enjoy our Thank You card which is making its way across the ocean to them. Even though they don’t speak any English and I don’t speak any German, there was no denying the generosity of Mr. and Mrs. L’s spirit. I will always remember Wuppertal for being the city where two kind Germans opened up their home and life to me.